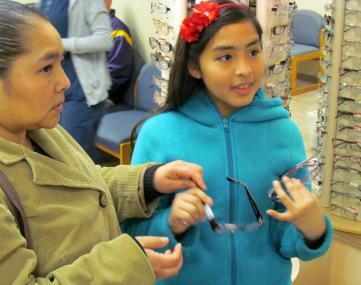 With a contagious smile and a penchant for conversation, nine-year-old Silvia eagerly tried on frames for her new glasses – glasses her family could not have provided without the kindness of Volunteers of America Greater New Orleans' Christmas Wish Project. After a few tries and many grins, Silvia and her mother selected the perfect, purple-rimmed pair, and Silvia was off to the exam room to see the optometrist. "In school recently we were learning about the five senses, and my teacher asked our class which of the five senses we wished was stronger," Sylvia enthusiastically recalled. "I said to my teacher, 'I definitely would like to see better!' I'm so excited to get new glasses!" Though her family has two children with vision deficits, and though Silvia's poor eyesight was starting to impact her school work—her family could afford to buy glasses for only one child each year. Sadly, Sylvia's family could not give her a new pair this year. So while that perfect pair of purple glasses may have been a routine purchase for another little girl—for Silvia, it was her holiday miracle. It will live on as Silvia is finally able focus on her studies, and her family can rest easy with one less financial obstacle. And it all started with the simple generosity of Christmas Wish donors Nicole Sciacca and Optometrist Dr. David Heitmeier. Thank you to all of our supporters who make miracles like this possible! You can help make miracles happen through this year's Christmas Wish Project! Email Connie Ernst, Marketing Director at cernst@voagno.org to bring joy to someone in need this Christmas!